Imagine a company that works to help give people sight, improve access to clean water, facilitate safe births and prevent bullying in formative years. That company exists in the form of TOMS, a global lifestyle brand with giving in its DNA. TOMS was founded in 2006 by Blake Mycoskie. Mycoskie’s idea was that for every branded TOMS product sold, it would provide the same product to a person in need, gratis, One for One®. This unique movement began in shoes, which has seen the company deliver 86 million new pairs of footwear to disadvantaged children. Jim Alling is the CEO of the global lifestyle brand and made his inaugural visit to Melbourne recently to announce TOMS’ B Corp certification, which sees it join over 2,700 companies across 60 countries working to deliver impactful, societal change. Justin Ware sat down with Alling to discuss the importance of becoming B Corp certified (Certified B Corporations are businesses that meet the highest standards of verified social and environmental performance, public transparency, and legal accountability to balance profit and purpose), the role corporations can play in society and the company’s efforts to end gun violence in the United States. Justin Ware: Good evening Jim, welcome to Melbourne. Jim Alling: Thanks Justin, it’s great to be here. What a city! JW: Can’t disagree with you there, let’s get the ball rolling. You’ve been with TOMS for almost four years now. Having served in a variety of corporate roles (Nestle, Starbucks, T-Mobile) prior, what was it that drew you to TOMS? JA: Three things. It was purpose, people and potential. I’ll be honest with you Justin, I didn’t know anything about TOMS at the time, but once I heard their story I needed to know more. As you note, I’ve been part of big corporations, but I’ve always sought out companies with a clear purpose. Founder Blake Mycoskie wanted to give disadvantaged children new pairs of shoes, but he was also reluctant to ask for handouts. So his logic was: if I can sell shoes and use that money to deliver a better experience to those children in return, that would be amazing. And he did it. As a result, TOMS was the first company to adopt the One for One® model, which is now used by over 200 companies around the world. And that’s the thing about TOMS, it started with a purpose and grew into a profitable company later on. To me that’s very powerful. Secondly, the people that make up TOMS are exceptional, it’s a unique type of person that’s attracted to a company like this. After spending some time with Blake and others, it was an easy decision to make. The third thing I saw was the potential of this company to continue to grow and have a positive impact in our society. At the time I was looking for that sense of fulfilment (a little selfishly on my part) and these four years have delivered that. When the company you work for has delivered over 80 million shoes (alone) to children in need, you can’t help but get excited about the future. 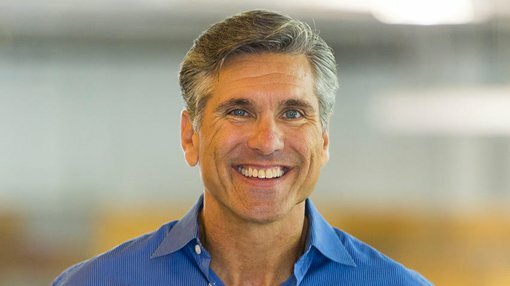 JW: TOMS now joins over 2,700 B Corp certified companies (congratulations), aside from the added layer of consumer trust and credibility, what are some of the other advantages this will bring? JA: It’s validation. If someone buys TOMS products, they’re usually pretty aware of what we stand for, but there’s always that natural scepticism. Are they really a good company? Is it all just marketing fluff? Becoming B Corp certified is strenuous and intense: it’s a vote of confidence by a third party group that audits and examines every facet of your business. It’s obviously great for consumers’ peace of mind, but furthermore it’s very important internally for our own people and the people we want to attract to our company. Aside from that added legitimacy, we’re now one of the larger B Corps out there, so we hope this inspires a new wave of companies to commit to being better and making a difference in the greater community moving forward. JW: That last point you make there is a nice segue into the next question. Larry Fink (BlackRock CEO) recently called for CEOs and executives to be more aware and pro-active in addressing societal issues – how can aspiring companies measure this? JA: I read that letter and I was impressed. As I mentioned earlier, we were the first to adopt the One for One® model – the amount of companies that now do the same is incredible. It’s the sincerest form of flattery and we want to continue to be a great role model for other companies out there. What Larry wants is for big business to take more responsibility for their actions and improve lives. Governments (when they’re functioning well) and non-government organisations (NGOs) can definitely make a huge difference, but it’s corporations that have the real swaying power. If we work to make a positive impact on the people and places we touch, it’s going to make a big, big difference. That doesn’t mean every corporation needs to adopt the One for One® model. If a company can make a commitment to a certain purpose or begin by gaining B Corp certification, the flow on effects can be outstanding. The companies that do make a commitment to becoming B Corp certified, you’re not just audited, you have to be exceptionally transparent about every aspect of the business, there’s no smoke and mirrors. I think going through that process and embracing that responsibility can begin to reshape what’s really important in the corporate world, and what isn’t. That’s not to say that TOMS is perfect because we’re not. We have a lot to work on and we listen to the critics out there because we’re always striving to improve. One of the interesting things about our recent B Corp certification was that we were actually above the threshold to gain the certification after the audit was completed, but we still made changes and improved things as a result of that process. I think if company’s can exercise that humility and have an ear to the ground, great things will happen. JW: It was last November that TOMS began its End Gun Violence Together campaign, can you tell me what the background behind that is? How does the company intend to impact change in this area and what has been achieved to date? JA: Absolutely. We’ve been moved deeply by the violence, as everyone has. The Thousand Oaks shooting early last November was a turning point for us. Why can’t this be fixed? What TOMS has realised is, just as much as children need a pair of shoes and a meal every day, they also need to be safe. We know that universal background checks are something that 90% of Americans want in place. It’s a process that will make it so much harder for bad characters to get their hands on guns. Do we expect this to end all shootings? No, but it will significantly reduce the risk, and it’s a great first step in the right direction. The US$5 million dollars that TOMS donated to groups working to end gun violence is the largest ever grant by a corporation towards the cause. We took our busiest sales period of the year (Black Friday through to Cyber Monday) and instead of our usual ‘Sale! Sale! 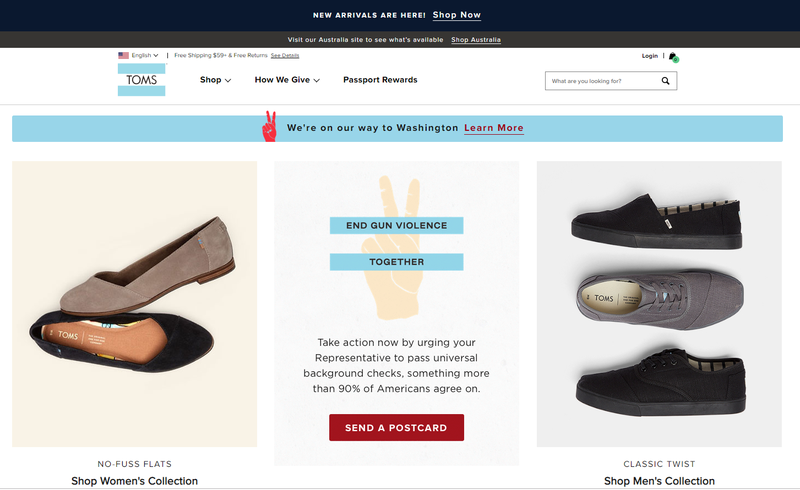 Sale!’ style campaign, the first thing consumers saw in store or on our website was our End Gun Violence Together movement. Our CTA wasn’t to go buy a pair of shoes or a nice shirt, it was to send a postcard to your local representative and let them know you want universal background checks passed. This bill is now moving through the house as we speak, we’re hoping to help pass that bill through the house and then the senate. People want us to make an impact on things they care about, and they will absolutely support you in making that action become a reality. Like I said earlier, we believe these kinds of events will inspire other companies to facilitate real, impactful change, and that’s what it’s all about. JW: The company launched its inaugural store in Melbourne last year, what’s on the roadmap for Australia moving forward? JA: We want to continue to give shoes, but we’ve heard increasingly from NGO’s and consumers that they’d like us to start impacting change in other areas as well. Locally, TOMS will turn its attention to the growing homeless problem in Melbourne. You can expect to hear more about that commitment in March, but we’re very excited about it and we can’t wait to grow our influence in Australia moving forward. JW: Incredible. Thank you for your time Jim, safe travels back.